Panacur (fenbendazole) is available in various forms. 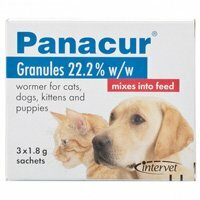 Panacur helps treat hookworms, roundworms, tapeworms, and whipworms in dogs and cats. It is also available for horses. 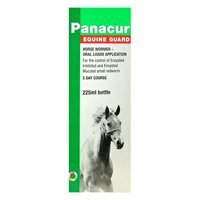 It is used by veterinarians to treat other parasites as well. The usual dose for dogs is one packet, based on weight, given once a day for 3 consecutive days. 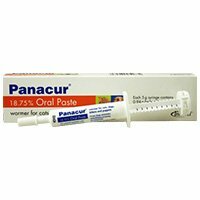 The Panacur C packaging recommends a daily dose of 50 mg/kg (which is about 1 gram of product for every 10 pounds your dog weighs). The medication can be mixed with a small amount of the animals usual food. Dry dog food may require slight moistening to allow for proper mixing.